Durga Puja is around the corner, evoking in me memories of how this festival was celebrated in what was then called Calcutta, and where I spent most of my adult life. Durga Puja is around the corner, evoking in me memories of how this festival was celebrated in what was then called Calcutta, and where I spent most of my adult life. Durga is welcomed into Bengal with a blowing of conch shells and the chanting of invocatory hymns in the pre-dawn autumnal mist. Devotees gather by the ghats of the Hooghly to offer prayers and flowers, and in village, town and city the early morning hush is quickened by the strains of a special radio programme of devotional songs marking the occasion of Mahalaya, the advent of the goddess. For three days, against a background of jostling crowds, clouds of incense, dazzling neon and the blare of amplified Hindi pop music, the tawny goddess astride her lion tramples the malevolent ‘Ashur’ underfoot, her lips curved in a calm, implacable smile. On the fourth day, the goddess is borne from thousands of homes and pandals, in trucks crowded with gong-beating, frenetically dancing young men, to the river for immersion. Slowly the images tilt and slide into the dark water, to be reclaimed by the silt of the river from which they came and from which they will be resurrected again next year. As in all things essentially Bengali, Durga Puja is an impassioned ritual combining awe and mystique, sentiment and spectacle. Like the stage plays and jatra folk theatre for which Bengal is famous, it offers a package deal of colourful pageantry, resounding rhetoric and common frolic. The centre of all the activity and excitement is Calcutta, or Kolkata as it is now called. From weeks beforehand, all the participants—which means just about everyone in the city—start preparing in their own various ways for the big event. Large banners and posters in shop windows proclaim pre-Puja sales with exclamatory insistence. In many households there is a spate of spring-cleaning and making provision for the numerous out-of-town relatives who will come to stay for the festive season. In traditional homes, the image of the goddess is decorated by the womenfolk, who also design the colourful alpana patterns on the floor, intricate creations of rainbow hues. Equally eye-catching are the special Puja anthologies that festoon the bookshops. The passion of the Bengali bhadralok for the printed word has created and sustained a unique literary phenomenon—known as the ‘Puja number’—which constitutes a `10 million-a-year industry. Contemporary readers have a choice of some 500 Puja publications, brought out by a variety of large and small publishing houses. The Puja number has come a long way since 1879 when the first such publication—a modest four-page affair—made its debut. By the 1940s there were about a hundred such publications, with a list of contributors reading like a who’s who of Bengali literature: Rabindranath Tagore, Sarat Chandra Chatterjee, Bonophool and Bibhuti Bhushan Bandopadhyay, author of Pather Panchali, on which Satyajit Ray based his film. Ray himself has written for Puja anthologies, besides helping to edit Sandesh, which was founded by his father. Puja specials have become bigger—though not necessarily better—since those days. A typical Puja number is like a literary Christmas stocking containing five or six novellas, 10 to 15 short stories, several essays and 20 to 30 poems, the package attractively illustrated and aggressively marketed. Authors have been known to produce seven or eight novellas in a single season, and one contributor has confessed to ‘writing with both hands’ to meet his commitments. Ramapada Chaudhuri, a well-known novelist and editor, has described how a writer was bitten by a stray dog and had to undergo a 14-day course of painful injections but did not allow this to deter him from completing his novel by the promised deadline. The story goes that two well-known writers who rivalled each other in output met just before the Pujas. One asked what the other’s score was. ‘Fifty-six’, was the answer, and the questioner hurried back to his desk to dash off one more contribution to catch up with his competitor. The speed at which writers have to work not infrequently leads to slips of the pen: characters inexplicably change their names in mid-story; a blind person is observed reading a newspaper; a pregnant woman takes two years to give birth to a child. Most readers take these solecisms in their stride, as part of the heady confusion of the Puja hustle and bustle. 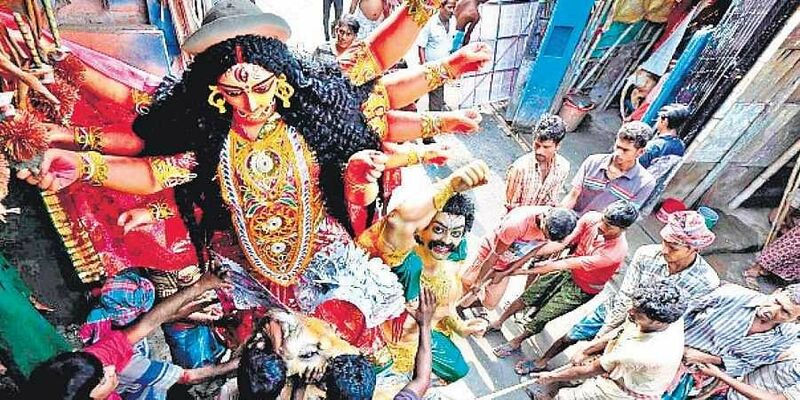 There are those, however, who feel that not just the Puja numbers but the Pujas themselves have become too much of a good thing, with commercialisation and pleasure-seeking having undermined the sanctity of the occasion. They point to cases of hooliganism, the loud playing of ‘filmee’ music, the prodigal extravagance of the pandals and the atmosphere of licence which have obscured the true significance of the Pujas.